Under the direction of David Yates, who took over as the series' director for the fifth film, ...and The Order of the Phoenix and will see the series out with Deathly Hallows Part Two next July, the Harry Potter films have sought to keep people interested whilst they wait for the final showdown between Harry and Voldemort by stretching the boundaries of what a Harry Potter film can be. Last year's ...and The Half-Blood Prince, for example, took the largely successful decision to throw out the plot of the book in favour of turning it into a romantic comedy with wizards. This time around, Yates and series' screenwriter Steve Kloves go one step further by turning it into an arthouse film with wizards. Following the death of Professor Albus Dumbledore (Michael Gambon) at the hands of someone he thought he could trust, Harry Potter (Daniel Radcliffe) finds himself increasingly isolated as the influence of Voldemort (Ralph Fiennes) and his hordes of Death Eaters grows. 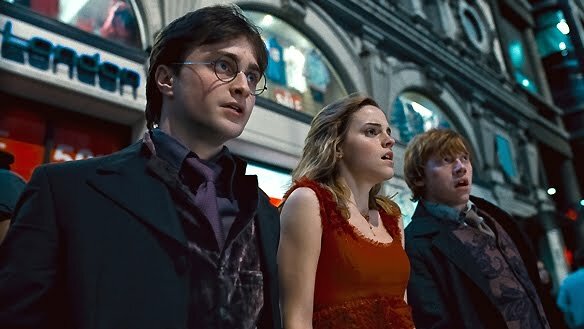 Fearing for the safety of the people he cares for the most, and desperate to see Dumbledore's work completed, Harry sets out with his friends Ron (Rupert Grint) and Herminone (Emma Watson) in search of the Horcruxes; items which have been imbued with part of Voldemort's soul, rendering him practically invulnerable until they are all destroyed. The decision to split the final Harry Potter film into two halves created a unique problem for Yates and Kloves. Knowing that pretty much of all of the action is contained in the latter half of the book - in the last one hundred pages, to be specific - how were they to make the first half, which consists largely of Harry, Ron and Hermione travelling over barren landscapes, bickering and living in a tent, cinematic. Their solution was to make it a character study which delves into the fears, hopes and relationships of three characters that audiences have spent seven films and nine years following. For me, this approach really worked. 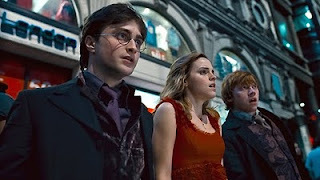 The story is simultaneously tighter than most of the other films, since we know from the beginning what it is that Harry and his friends are after, and looser than most of the other films, since the story will not reach its resolution until the end of Deathly Hallows Part Two. Yates and his crew fill the time in between duels and escapes with texture and mood, creating an atmosphere of dread and paranoia that starts out vague and becomes painfully and suffocatingly specific by the final scenes of the film. A trip to the Ministry of Magic, now run in secret by the Death Eaters, shows us anti-Mudblood propaganda being produced and a particularly disturbing statue depicting Muggles being crushed under rocks, since that is their rightful place in the eyes of Voldemort and his followers. There has always been a fascistic air to the cult of the Death Eaters, with their talk of "pure" blood and hatred of a people purely because of the accident of their birth, and little glimpses like this both build up the world of the story and helps establish what is at stake, something that could be lost when so much of the film feels so small for the final part of an epic saga. If Harry does not succeed, the world as they know it will be lost. It's these sort of details that make the film interesting and which could easily have been left out if they had tried to cram the whole book into a single film. It's also worth mentioning that, although it marks the darkest and saddest film in the series, it's still got plenty of the exciting action sequences, moments of humour and little character moments that fans of the series have come to expect. It also boasts two scenes that rank among the most striking in the entire run of the series, though for entirely different reasons. In one, a children's story is told using a striking, splintered animation style that's beautiful and creates the sense that we are remembering an old legend that we were told as children, even though we are hearing it for the first time. In the second, Harry and Hermione dance to "O Children" by Nick Cave and The Bad Seeds. It's a scene both full of joy and achingly sad, a last fleeting moment of innocent, giddy abandon as the world falls apart around them and the night grows ever darker. It's as touching as it is silly, and it is a credit to Radcliffe and Watson that they manage to sell the emotion of a scene which, if misjudged, could have derailed the whole film. All this atmosphere and mood does not hide the fact that the film is still yet more padding. Series regulars like Draco Malfoy, Hagrid and Neville Longbottom only get brief appearances since they will play a bigger part in the conclusion, and even though the film ends on a note of poignancy as a yet another minor but important character gets killed saving Harry, the very last scene reinforces that there is still more story to tell. As set-up, Harry Potter and The Deathly Hallows Part One is the best film that could have been made, but it's also frustrating because after two and a half hours we still haven't reached the fireworks factory. But at least we can see it from where we're standing now.